Residents in Henley on the Taieri are being advised to evacuate as rain continues to fall in Dunedin, but the worst of the weather appears to be over. The front of a house in Ravensbourne has been turned into a waterfall and there is widespread surface flooding across the city and Mosgiel, the Water of the Leith is running very high. However, as of 5.45pm a Fire and Emergency New Zealand said it had 10 appliances at flood-related call-outs and it appeared the worst of the weather was over. The Otago Regional Council has opened the Riverside spillway gates on the Taieri River at Outram to divert flooding into a ponding area part of the Taieri Flood Protection Scheme. Both police and NZTA have warned against non-essential travel, with NZTA saying strong winds were also bringing down trees. ​Houses across West Harbour are without power after a deluge of rain caused flooding across the area this afternoon. Aurora Energy said properties in Parry St, Fern Rd, Ravensbourne Rd, Athol Pl, the suburb of St Leonards, Anzac Ave, and the harbour industrial area had lost power about 4pm. The lines company estimated the power would be back on at 8pm. By 6pm power had been restored to some residents in St Leonards. Three Mile Hill Rd was now closed. ​Council city services general manager Sandy Graham said police started door-knocking Henley properties this afternoon advising them to evacuate and be prepared to be out of their homes for several days. At this stage, residents have decided to stay in their homes. Access to Henley is limited with one road already closed due to a slip. Access is currently via Henley-Berwick Road, but this may be closed if water levels rise. Flooding could also affect about 15 properties in the township. She advised people across the city to stay off the roads. “Not all flooding is signposted. If you need to drive, please reduce your speed through flooded areas so water isn’t pushed into properties." SH88 was down to one lane and a range of local roads were closed. The council had received reports of slips blocking the road to Aramoana at Deborah Bay and contractors were on their way. Residents were also warned to treat flood water as contaminated. ​The Dunedin City Council is also asking residents in the city to avoid using showers, dishwashers and washing machines to ease pressure on the city's wastewater network, as the predicted torrential rain begins to hit. Ravensbourne and Mosgiel are being hit by some of the worst flooding, with Gordon Rd closed for a time due to surface flooding. By just after 4pm the rain appeared to be easing and according to the MetService the deluge was expected to ease before trailing off almost completely by 8pm. This comes as police are warning people across Otago to avoid non-essential travel as the region is deluged with heavy rain. A Fire and Emergency spokesman said fire crews had been called out to 14 flooding events in Dunedin and surrounding areas in the past few hours. Most of the flooding has been isolated to single properties where water has got into a basement or come through a roof, the spokesman said. In Ravensbourne the front of a property, opposite from Moller Park, had turned into a waterfall. Some residents in the suburb were without power. Several dips on State Highway 88 by Ravensboune were deep in surface flooding, forcing heavy traffic to grind almost to a standstill. A large slip just past Maia closed the highway's northbound lane, forcing firefighters to act as impromptu traffic controllers. At least one car was immobilised by flood waters. Meanwhile in Manapouri St, driveways and sections transformed into waterfalls, as firefighters scrambled to clear drains. The flooding appeared to have subsided somewhat shortly after 4pm. ​Earlier water needed to be pumped off the runway at the Dunedin Airport after a Air New Zealand flight from Auckland was forced to land in Christchurch this afternoon. In Mosgiel shops were protected from flooding by sandbags. Traffic was backed up for about 1km on Kaikorai Valley Rd from the turn-off to the Southern Motorway as motorists negotiated a stream of water flowing down the street. There was widespread surface flooding on Taieri farms and across Dunedin streets generally. Airport marketing and communications manager Megan Crawford said standing water on the runway meant it was too dangerous for the Air New Zealand jet to land but a smaller ATR plane was able to land safely not long after. "At the moment we're just monitoring the situation and our rescue fire team are pumping water out around where we are and we're obviously we're hoping this rain out where we are just eases a little bit." The airport's website would be updated with any further cancellations or delays. Dunedin man Simon Bishop was on the plane which tried to land twice before diverting to Christchurch. "It was pretty scary the first time we didn't even break the cloud before we speed off then the next time we got pretty low but had to pull out again." The plane and passengers would be flown back to Auckland because there is no accommodation in Christchurch, Mr Bishop said. Speaking earlier from the Dunedin Civil Defence Emergency Management bunker this afternoon, Ms Graham said the bunker had been activated, but an emergency had not yet been declared. "We're not declaring, we're just activating, which means we've got folk from all the key areas in the Bunker, so we can have good clear communication to keep a watching brief on what's happening. Dunedin Civil Defence is calling for volunteers to help with sandbagging in South Dunedin. They are asking for people to go to the Dunedin Ice Stadium car park in Victoria Rd and bring a shovel if possible. Mosgiel and South Dunedin residents concerned about flooding could collect sandbags from the Memorial Park car park, the Hotel Taieri car park at the corner of Burns and Kings Sts and the Ice Stadium car park. Motorists were asked to drive to the conditions and avoid driving through surface flooding if possible. NZTA is warning of surface flooding on SH1 between Dunedin and Waitati. MetService meteorologist Ravi Kandula said a heavy rain warning remained in place for eastern Otago until 7pm this evening and steady rain was expected to get heavier this afternoon when "significant" falls were expected. The heaviest rain was expected to fall about 4pm in Dunedin. According to the MetService's rain forecast graphic the significant front is expected to approach from the east and pass directly over the city between 2pm and 8pm today, dropping 30mm-40mm of rain in total from 2pm until this evening. It will then spread westward, bringing heavy rain to Central Otago and Southland. The DCC says a high tide expected this evening will add pressure to the city's water networks. Council Three Waters group manager Tom Dyer said the 2m tide predicted by metservice for Dunedin about 2.30pm would be "just another pressure on top of the rain". However, it fell short of the 2.2m threshold for a ''king tide'' used by the Council. The Otago Regional Council issued flood warnings for rivers and streams across the region, as the Taieri River begins to flood. The Taieri River at Outram is on its third flood warning after a high level alert this morning, and is well past the level where it begins to spill over the left bank at the Riversdale Spillway. Heavy rain hits Stuart St as a front moves over Dunedin yesterday. Deep Stream at State Highway 87, Nenthorn at Mt Stoker Rd near Middlemarch and the Waitahuna River at Tweeds Bridge are on their second flood warnings. In an update about noon it said its main focus was the lower Taieri River, particularly at Henley. Rainfall overnight was higher than forecast, and water was spilling into the upper pond of the lower Taieri Flood Protection Scheme. Landowners in the area had been contacted by ORC and it is likely the riverside spillway gates will be lowered this afternoon to reduce effects on properties further down the river at Henley. Dunedin City Council said in an update this morning that rain had caused some localised issues overnight and it was continuing to prepare for more heavy rain. Rainfall had been higher in inland parts of the city and the MetService had issued an updated heavy rain warning, with between 40mm and 70mm expected between 9am and 7pm today. There was some flooding in the Henley area and also around Mill Creek between Hazlett Rd and Dukes Rd North. Riverside Rd is closed as the Taieri River flood scheme’s northern ponding area is beginning to fill. Three streets in Middlemarch were closed due to surcharging from the wastewater network and a pump was bring used to provide extra capacity. The stormwater and wastewater systems were running well, but the DCC was ready to use mobile pumps if needed. There has been some surface flooding and several minor slips in other parts of the city, but no significant issues. A number of rural fords were closed as a precaution yesterday and will remain closed today. DCC staff and contractors spent yesterday actively preparing ahead of the forecast rain. Chief executive Sue Bidrose said yesterday the ground was already very wet following recent rain, and further significant rain could cause flooding and slips and make driving difficult. Staff and contractors checked stormwater and wastewater systems to make sure they were working well, and road maintenance contractors were out sweeping gutters around the city and doing additional checks of mud-tanks in low-lying and high-risk areas. Council also advised residents to clear their drains and gutters. Sandbags were placed around the Radius Fulton rest-home in South Dunedin yesterday afternoon as a precaution. Residents at the facility have had to be evacuated twice in the past three years because of flooding. Some rural fords were closed yesterday ahead of the predicted heavy rain, including the ones on Silverstream Valley Rd, Flagstaff-Whare Flat Rd, Gladfield Rd, Taioma Rd and Waitati and Miller Rds in the north. Late last night, State Highway 8, on the Ettrick side of Roxburgh, was closed due to flooding. Otago Regional Council (ORC) staff monitored river flows overnight. A spokesman warned the Water of Leith and Silver Stream were expected to reach their peak flows today, but river flows in the area were expected to be less than those in July 2017. 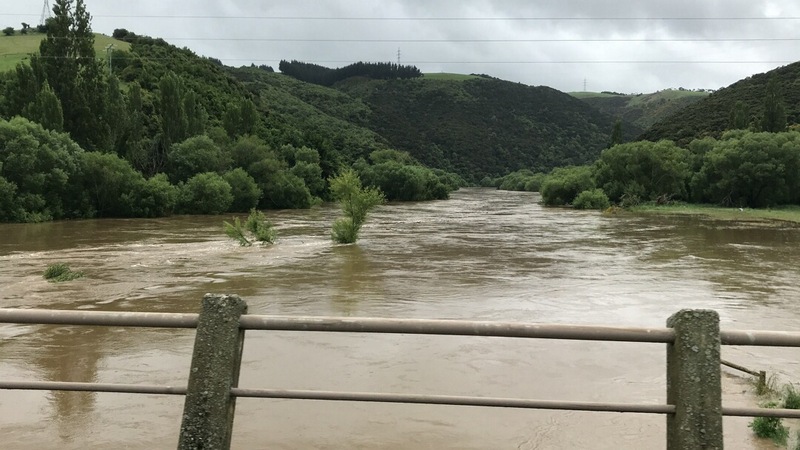 North Otago catchments were likely to receive the highest rainfall and the Kakanui River was expected to reach peak flow this morning. The ORC spokesman advised caution in the Pomahaka catchment today, but said the Clutha River at Balclutha was expected to remain within its channel. Dunedin was hit by extreme weather yesterday, including large hailstones which fell on the Northern Motorway and a lightning strike on an Air New Zealand ATR-600 near Dunedin Airport. MetService advised Otago and Southland residents to keep up-to-date with the latest forecast in case more areas were added to the warnings list. Central Otago and Queenstown residents were mopping up last night after heavy rain and snow led to cancelled flights, power outages, and downed trees. Snow forced the closure of the Crown Range Rd and State Highway 94 between Te Anau and Milford for several hours yesterday. MetService meteorologist Tui McInnes said while snow in November was "not unheard of'', it was unusual. Queenstown Airport remained open yesterday, but some flights were delayed or cancelled. The weather also led to power outages around Arthurs Point, Dalefield, and Lower Shotover. Todd McIvor, of McIvor Plumbing, places sandbags around the Radius Fulton aged-care facility in South Dunedin. The millions spent on the Leith by the University (as they sacked staff) and the DCC do not seem to control the overflow. No doubt it creates employment as does the regular change of tiles of the slippery paving inside and outside University buidings.